In large bowl, mix popcorn, snacks, pretzels and cereal. In small bowl, mix remaining ingredients. Drizzle over popcorn mixture, tossing until evenly coated. Spread in ungreased 15x10X1-inch pan. Bake uncovered 15 minutes, stirring twice; cool. Store loosely covered at room temperature up to 2 weeks. 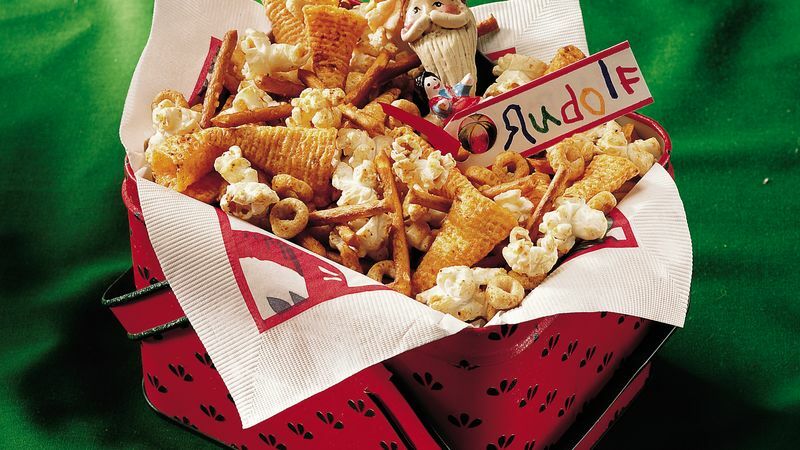 Make party favors out of this addictive snack mix. Wrap 1-cup portions in holiday-themed plastic wrap, and tie with green and red ribbon. Personalize packages by attaching a small gift tag with a guest’s name written on each. Make Sweet Reindeer Snack when you use original Bugles®, replace chili powder with cinnamon, omit garlic and add 2 cups of red and green candy-coated chocolate candies. Microwave Directions: In 3-quart microwavable casserole or bowl, microwave butter, chili powder and garlic uncovered on High about 1 minute or until butter is melted; stir. Stir in popcorn, snacks, pretzels and cereal. Toss until well coated. Microwave uncovered 6 to 8 minutes, stirring every 2 minutes, until toasted; cool.